Hey there. Thanks for checking in. We're still in the process of finishing up. For the last couple months I've been saying "we'll be done in about a month." At this point we're looking at finishing up sometime in April, i.e., in about a month. 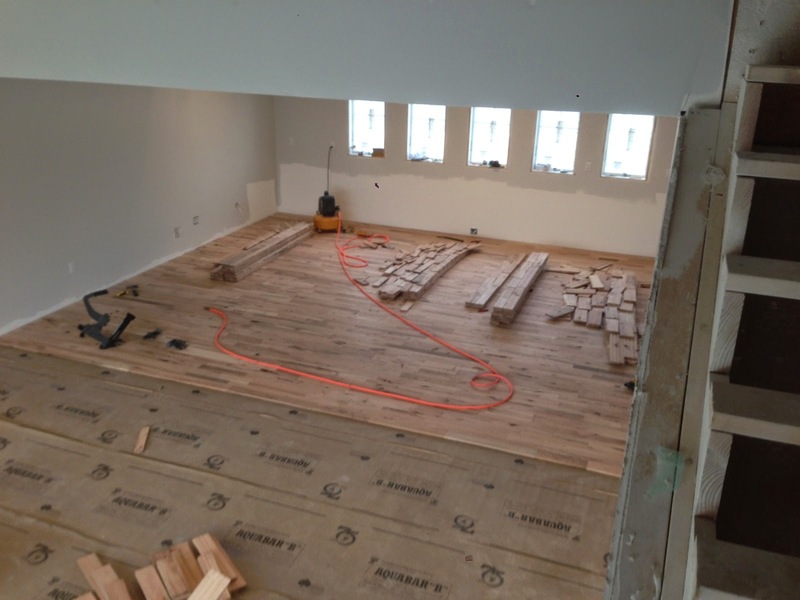 We've just about wrapped up the hardwood floors. 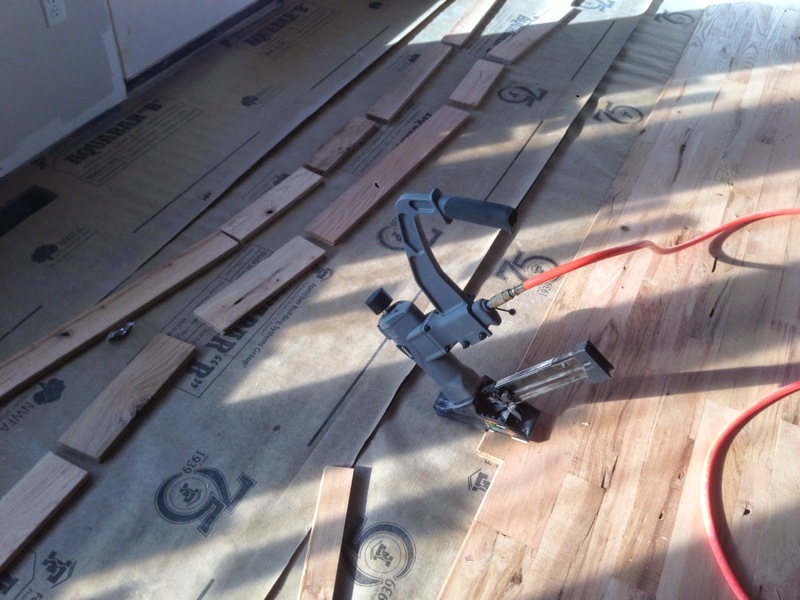 We have about 1,600 sq ft of hardwood on the main level, along with the stairs and two landings. We opted to install it ourselves, going with red oak as our choice of material. Rustic has been our theme, so we went with mixed widths, combining four widths: 2 1/2, 3 1/2, 4, and 5 inch boards in a random distribution. To start the installation, we scrapped up all of the excess drywall mud that had dropped on the floor. The floor needed to be as smooth as possible, as any bumps or defects would translate through the floor. After cleaning the floor, we installed an asphalt paper as an underlayment. 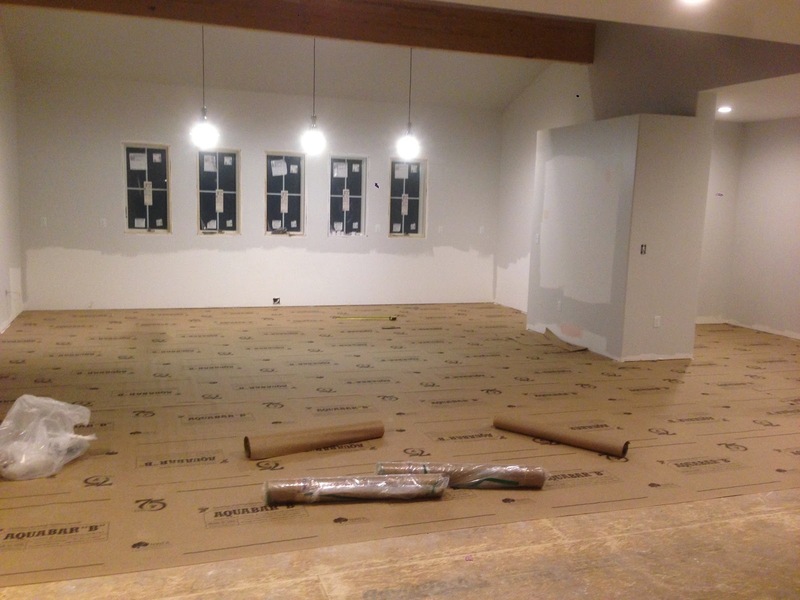 The underlayment helps act as a moisture barrier, as well as provides a smooth sliding surface to help the floor boards move during installation. 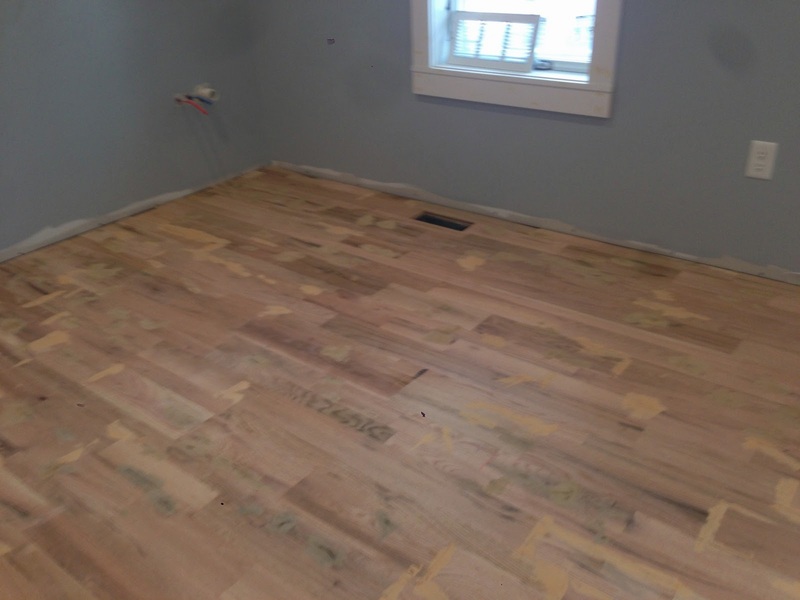 The hardwood had been inside for about four weeks acclimatizing to the temperature and humidity of the house. We then used a floor nailer to nail through the tongues and into the subfloor. I picked one up on Amazon for about $100. 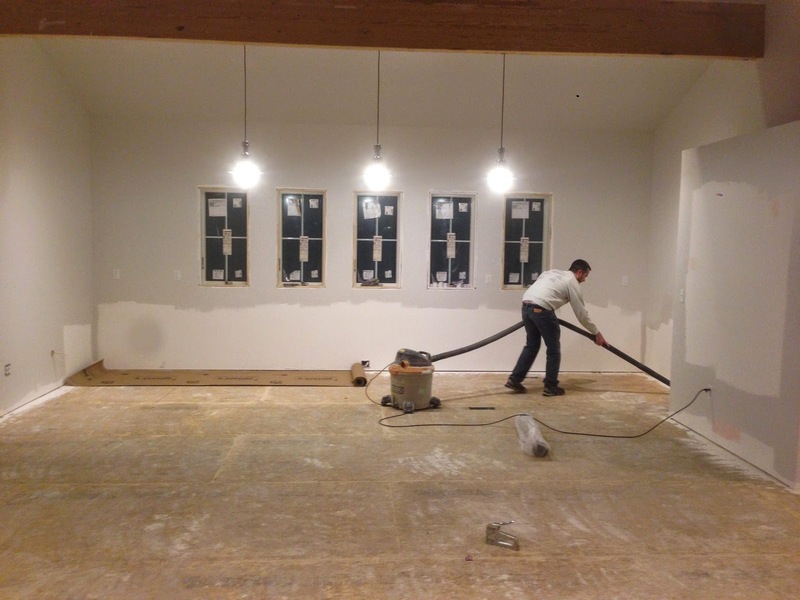 Matt and Steve helped set up the process, and which we were able to install the floor over a two week period. 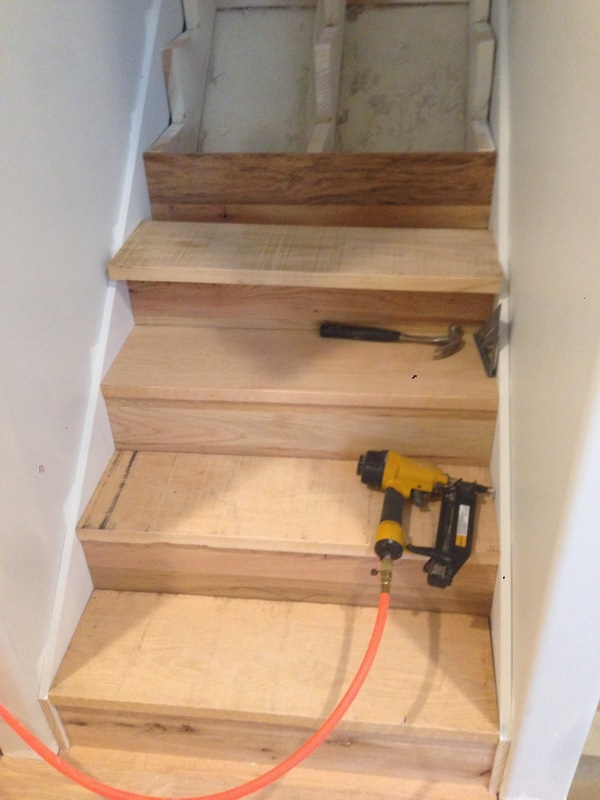 Since we had red oak floors, we wanted red oak stairs as well. I purchased some rough cut 5/4" boards about 11" wide, and cut them to fit as treads. I sanded them smooth, which took off any splinters but left the character of the rough cut. Extra flooring was used for the risers. After all the flooring was installed, Mandy filled in any big gaps using a professional putty that I ordered from Chicago. It was mainly used to fill knot holes and end gaps. Next up: staining and finishing the floors. I also need to catch you up on the stair rail installation and front yard drainage.